The power of second order revenue. Second order revenue is powerful, but it’s often overlooked by startup founders. It’s when your startup really starts to grow and take on a life of its own. While revenue isn’t the most precise measure of a startup’s health, you’ll do pretty much anything you can to get more of it as cheaply as possible. Cash on hand makes running and growing a startup a lot easier. We can break revenue down to two types: First order and second order. First order revenue comes through the usual methods: customer acquisitions, upgrades to higher plans, upsells/add-ons, cross-sells, and any other ways you expand your accounts. Second order revenue is quite powerful, but it’s often overlooked by startup founders. Second order revenue is when your startup really starts to grow and take on a life of its own. What is Second Order Revenue? Second order revenue is the revenue generated by your post-sale service. Essentially, it’s how you extract more revenue from the same account. Second order revenue usually comes through referrals. You can also get second order revenue when your contact at one company changes jobs and convinces the new company to use your service as well. This is coined the “champion of change” by Jason Lemkin, which is kind of like a referral, in its own way. Second order revenue is quite powerful, but it’s often overlooked by startup founders. The beauty of second order revenue is that you’ve already paid the customer acquisition cost. Perhaps a more accurate take: it lowers your customer acquisition cost while simultaneously raising your customer lifetime value. In the long term, second order revenue can become a significant part of your total revenue. Some startups’ marketing strategies actually prioritize second order revenue as a way to drive customer acquisition. Dropbox, for instance, is the most famous example of a startup that relied heavily on second order revenue as they grew. In 2008, they implemented a referral program that rewarded existing customers with extra storage space for successful referrals. In just over a year, they exploded from 100,000 to four million subscribers – almost entirely through second order revenue. Now, that’s an unusual case study. Second order revenue doesn’t beat first order revenue at most startups. You’ll still have to build a growth strategy that includes cold customer acquisition, but Dropbox’s story is a great example of how profitable second order revenue can be. Customer lifetime value is a fairly straightforward calculation, but most startups fail to include second order revenue in their calculation. “Standard first-order only CLTV analyses underestimate true revenue generated by customers by 50-100% in most SaaS models selling to anything larger than SMBs,” says Jason Lemkin. If a customer spends $1200 on a year of your service, renews for another year at a higher plan (say, $2000), and purchases a $500 add-on during the third year, what’s their lifetime value? But what if that customer refers you to another customer who also spends a similar amount? Suddenly the lifetime value of the first customer got a lot bigger, as did your average customer lifetime value. 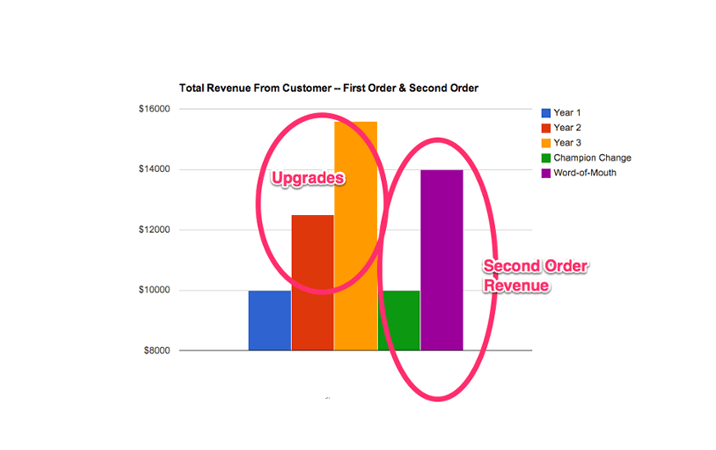 As you can see, second order revenue has the potential to create massive shifts in your company. Referrals are easy growth without much of the cost. Like all forms of startup revenue, early second order revenue helps you incite more growth. Cash on hand means faster experimentation and iteration. Then once you find the tactic that drives the most growth, more cash lets you invest into deeply. So it’s important to quickly find ways to drive second order revenue. We’d love to talk about what matters to you.